Growing potatoes in the ground takes up lots of room and some smaller gardens don't have enough space. Don't despair, you can grow your potatoes in containers. You'll never have as many as those in a large garden but you will be astonished at how many you can grow in a very small space. All you need is a largish container, some general purpose compost and a few seed potatoes. Growing potatoes in containers is very similar to growing them in the ground. 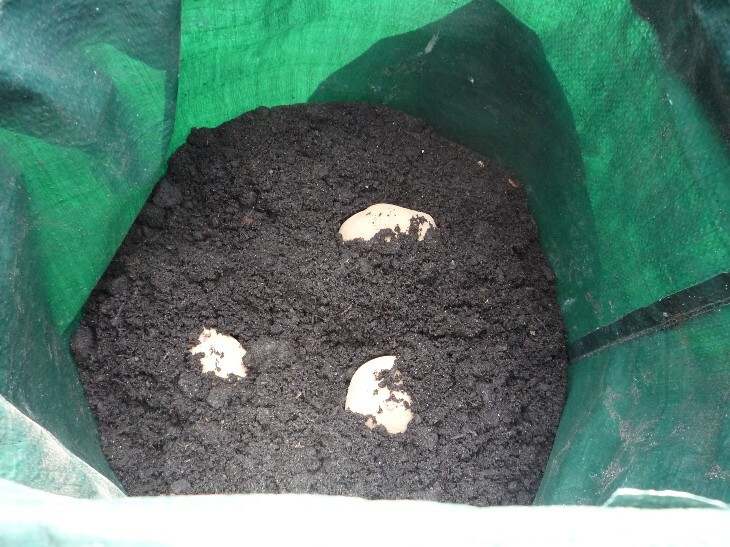 The picture below shows a purpose made plastic bag for growing potatoes in. It is designed to accommodate three or four seed potatoes. It's simple, relatively cheap, readily available and will last for several years. But it's not the only solution to growing potatoes in containers. Almost any largish container can be used as long as it has holes in the bottom for drainage. Some people use dustbins others use several smaller containers with only one or two seed potatoes in. Our own practical experience with different sizes of container is slightly at odds with some enthusiastic articles found in gardening books and websites. We have found that dustbin sized containers give a crop of potatoes the same size as a bucket or specifically designed potato bag as shown above. Not only is the crop size about the same but the smaller containers use up far less compost. Whatever you use to grow your potatoes in, make sure it has drainage holes to avoid water-logging. 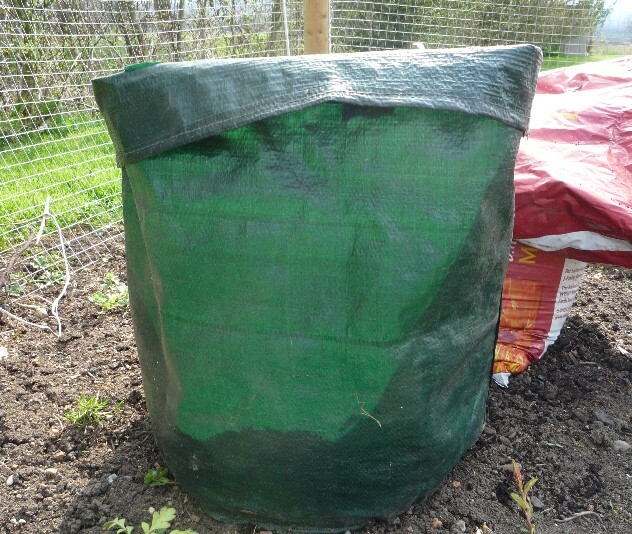 The other problem with dustbins is that planting potato tubers half way down them and then covering with a layer of compost hides much of the available sunlight from the new potato plants when they emerge. This results in leggy growth which is liable to breakage. Our strong advice would be to use a couple of buckets or a specially designed container. The process of growing potatoes in containers is very similar to growing them in the open ground. First chit / sprout the potatoes exactly as normal. Click here for our page on chitting / sprouting potatoes. One advantage of growing potatoes in containers is that the container can be moved into a frost free position if a late frost threatens. Almost all potato varieties can be grown in containers so any recommendation is purely a matter of personal taste. Our preference is to grow Swift for the earliest crop of all. We also grow Nicola which is a second early. It has the advantage that it keeps growing if harvested late and stays in good condition in a container for at least a couple of months. Using normal general purpose compost from the garden centre, fill the bottom 12cm / 5in of the container. Simply place the chitted / sprouted seed potatoes on the surface of the compost. The fourth week of March 2015 in average areas of the UK is about the right time for planting potatoes in containers. The size of the container will determine how many seed potatoes to use. For containers about 30cm / 1 ft in diameter (the minimum size of container) use one seed potato. For a 75cm / 2ft 6in container we used 3 seed potatoes. Cover the potatoes with 12cm / 5in of garden compost and then water well. Fill in a marker to show the variety of the potatoes. The next step is easy, simply wait for the potato plant to appear above soil level. Keep the compost lightly moist during this period watering whenever necessary. 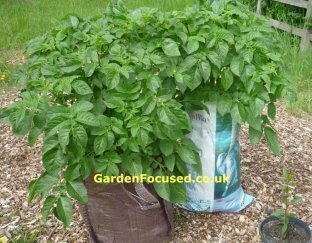 If you want earlier than normal potatoes then it is possible to plant the seed potatoes in containers two weeks earlier than normal. You must however be willing to move the container to a frost free position on frosty nights / days. This takes some effort and also you need to keep a constant eye on the weather forecast for two weeks or so. But the reward is earlier potatoes - the choice is up to you! Caring for potatoes in containers is very similar to caring for normally grown potatoes but with a few differences. First, potatoes in containers require watering frequently in warm weather. The large canopy of leaves looses lots of water and it needs to be replaced often. The earthing up process also needs to be done but in the case of container potatoes simply add eight or so centimetres of additional compost when the growth is 10cm / 4in above the soil. Keep doing this until the soil is at the top of the container. Feeding potatoes in containers is simply adding a handful or two of fish, blood and bone sprinkled onto the compost and then worked into the surface gently with your hands. Do this once every month. 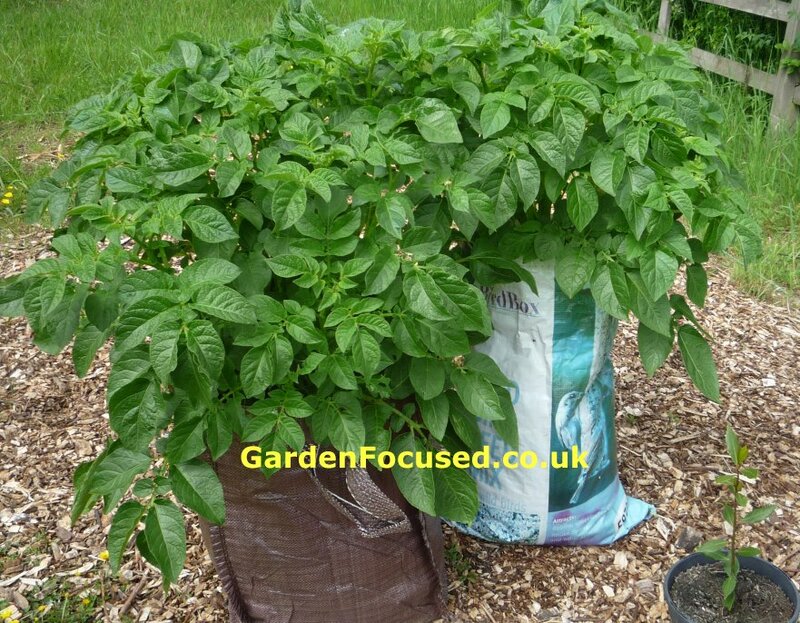 Avoid feeding with nitrogen rich fertilisers such as Growmore or Miracle Gro, they tend to result on lots of foliage at the expense of potatoes. Harvesting is simple if a bit mucky. Gently burrow your hand in the soil until you find potatoes of the correct size and pull them out carefully. Try to disturb the soil and roots as little as possible and settle it down again after you have have retrieved your potatoes. The plant will happily continue to produce larger potatoes.